Staff will experience rustic, outdoor living at Gold Arrow Camp. Group and activity counselors live with groups of 8-10 campers in large canvas tents on wood platforms with a deck. 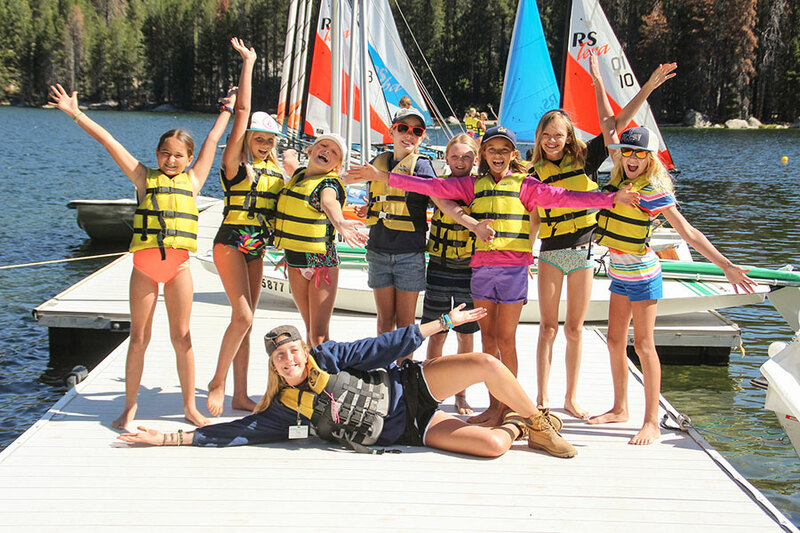 Group counselors are primarily responsible for the overall well-being of their cabin group. They live with and lead their group of campers to activities and meals and assist in teaching during our Free Choice activity period. Activity counselors are responsible for the organization and instruction of an activity during program periods. There are at least two counselors within each cabin group, one group counselor and one or two activity counselors. Many campers and staff sleep on the deck under the stars. Bring your sleeping bag to sleep on comfortable army style cots. Modern bathroom facilities with private showers are located near tents throughout camp. Campers and staff dine on an open-air, covered dining porch that overlooks Big Creek. Healthy, well-balanced, delicious meals are prepared by our chef and kitchen staff. A fresh, well-stocked salad bar is offered at both lunch and dinner. There are a variety of options, like our pasta bar, for selective eaters. Gold Arrow offers over 20 outdoor, recreational activities including waterskiing, horseback riding, sailing, rock climbing, canyoneering, archery, riflery, drama, arts & crafts, canoeing, fishing, backpacking, knee boarding, ceramics, day hikes, campfires, and skits. Our structured program ensures that every camper will be able to participate in most activities. Our camp schedule is designed to ensure that each camper participates in all of the activities offered for their age group. The morning and afternoon activities are scheduled for cabin groups to participate in together. These shared experiences create a framework for the group to bond, strengthen friendships, and create memories. This also ensures that campers will try most of the activities while at camp, even if they are a little unsure or nervous about a particular one. Campers are never forced to try an activity, but are required to attend and strongly encouraged to participate. There are certain activities, such as mountain biking and canyoneering, in which only our oldest campers participate. Campers participate in activities of their choice during in the evenings and the optional early morning activity times. Anyone who has worked at a summer camp before will tell you that it’s unlike any other job you will have. While working at camp, staff members not only have the opportunity to make a positive impact upon the lives of our campers but also positively impact their own lives. Staff members participate in a week-long training before any campers arrive. During this time, our staff learn about child development issues, conflict resolution, team building, and communication and leadership skills. At the end of each summer, our staff walk away with valuable life skills that can be used in any career, as well as friendships that last a lifetime. Working at camp can mean making big sacrifices in terms of having a lack of personal time and space, having to put the needs of your campers above your own, and enjoying fewer personal freedoms than you do at home. Successful counselors want to work with children and are willing to make the sacrifices necessary to live in community at camp. If you want to spend your summer working hard and making a difference in kids’ lives, this may be the job for you.